This is my first tentative step towards owning a fully fledged Japanese-style plane for use in the workshop. I say 'tentative' because I am, in fact, quite satisfied with the range of planes already sitting in my tool cabinet, and with this in mind, I wouldn't normally seek alternatives. 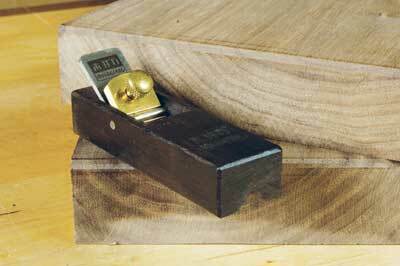 However, a chamfer plane is something I don't possess, so this seemed a good idea. The plane is set up from new to create a 3mm-wide chamfer, but a slight increase to the depth of the 'V' channel would reduce this. Similarly, a widening of the channel would increase this, but at just 90mm long, this little plane feels as if it's already operating at full capacity. I guess it's not hard to make a block of ebony (Diospyros spp.) look attractive and the solid brass lever cap and pin certainly add to its appearance. So to the all-important question: do you push or do you pull? Well, as this is more Japanese in style than substance, you can do either and get the same perfect results. It's absolutely not a must-have tool but just you try and relieve me of it now that I've got used to it.